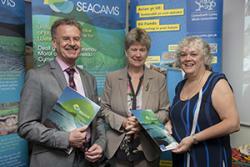 SEACAMS Director, Prof Colin Jago, Finance Minister Jane Hutt and SEACAMS Project Manager, Dr Gay Mitchelson-Jacob at a recent SEACAMS event in Cardiff.Bangor University Vice-Chancellor John G Hughes has welcomed the news that the £23.6m SEACAMS project, which it leads, has been given a £1m EU boost. “The SEACAMS project is an excellent model illustrating the way that universities can have real impact. This project is contributing to the economic success of Wales in a sustainable manner and reflects the way that academic expertise can work hand in hand with business and industry to make the best use of new technologies and resolve the challenges facing us. “This further funding will extend the good work that has already taken place under the SEACAMS banner,” he added. The additional funding will enable the project to expand its work to map and collect data in the Anglesey Demonstration Zone which has been established by the Crown Estate to explore opportunities for offshore renewables in Wales to mitigate the effects of climate change. The data collected, including model simulations of marine systems produced from such data, will be made available to businesses to develop services and technologies, such as tidal devices, which could be deployed in the area. It is expected that the resource will increase the likelihood of companies choosing Wales as their preferred site for ongoing and future developments in the offshore renewables sector. Minesto, a European tidal energy company planning to establish a base in Wales later this year, is one of the companies already benefiting. SEACAMS’ modelling expertise is helping explore the best place to locate their innovative device, called Deep Green, which can reach a speed 10 times higher than the water current to generate electricity. SEACAMS is planning to hold a workshop with companies to engage with offshore survey companies interested in developing collaborative projects in relation to the demonstration zone work. The SEACAMS project is part funded through the EU’s Convergence European Regional Development Fund through the Welsh Government.